Arctia villica — “creamspot tiger” | Welcome, visitor! 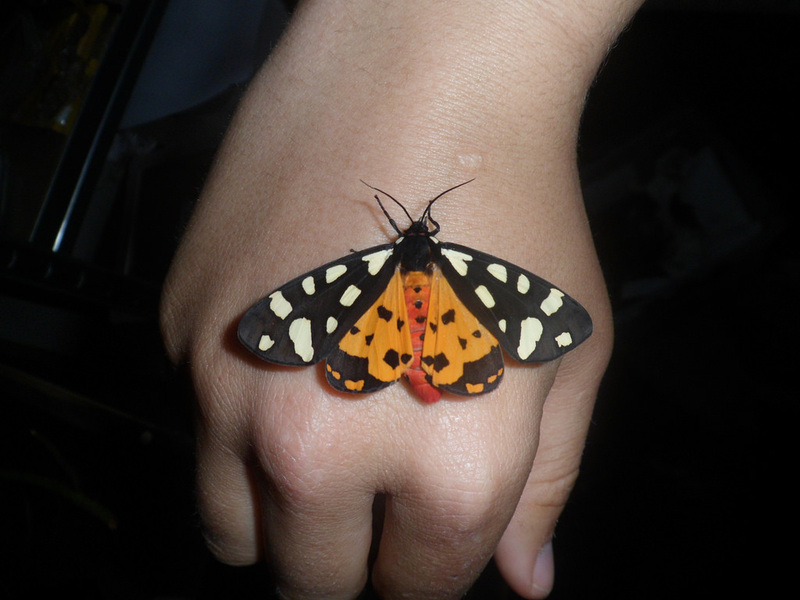 Arctia villica, the creamspot tiger moth, is a very colourful species of tiger moth. It it distributed through Europe and parts of Africa. 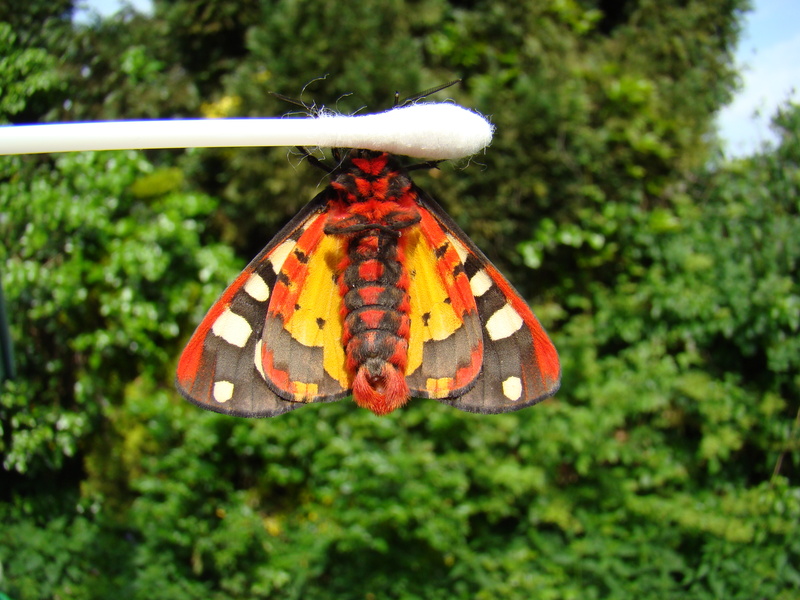 Their colours are an aposematic warning towards predators, for the moths are quite distateful due to host-plant derived toxins and predators prefer to leave them alone. Arctia villica are quite polyphagous, which means the caterpillars are more than willing to feed on multiple kinds of host plant. Among known hosts plants are Taraxacum (dandelion), Plantago (plantains), Lamium (deadnettle), Urtica (nettle), Hieracium (hawkweed), Rumex (dock) and many more low-growing herbaceous plants. Arctia villica is single brooded, with moths flying from may until about august. After reproducing, the next generation of caterpillars will overwinter, waiting for the next spring before emerging as moths. The larvae may develop slowly in captivity and patience is required to rear them. The caterpillars are brown and hairy, with a wine red head capsule. Metamorphosis.. caterpillar, pupa, moth! 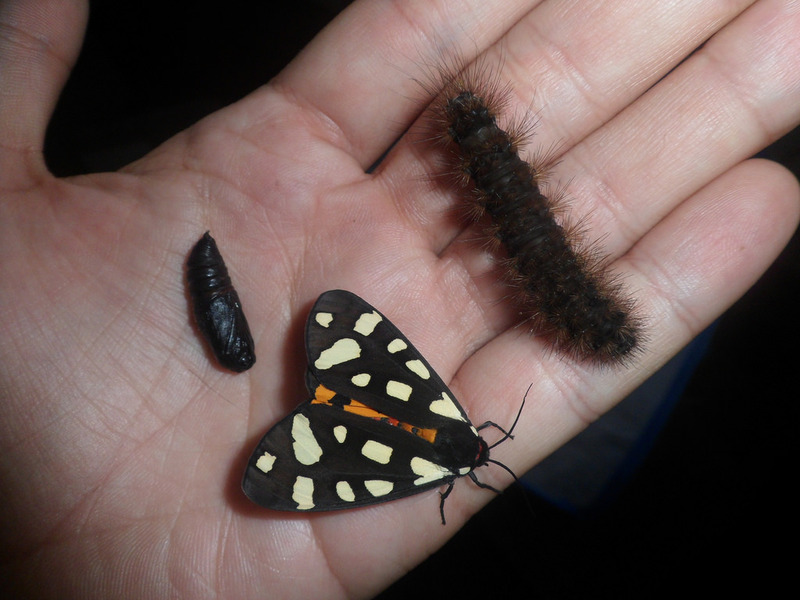 It is a privilege to hold all life stages of Arctia villica in my hand. The females are à little apathic and would rather wait for a male, they don’t move that much. Males are a bit more nervous and are quite eager to fly. These moths cannot feed and will only live for a short while. 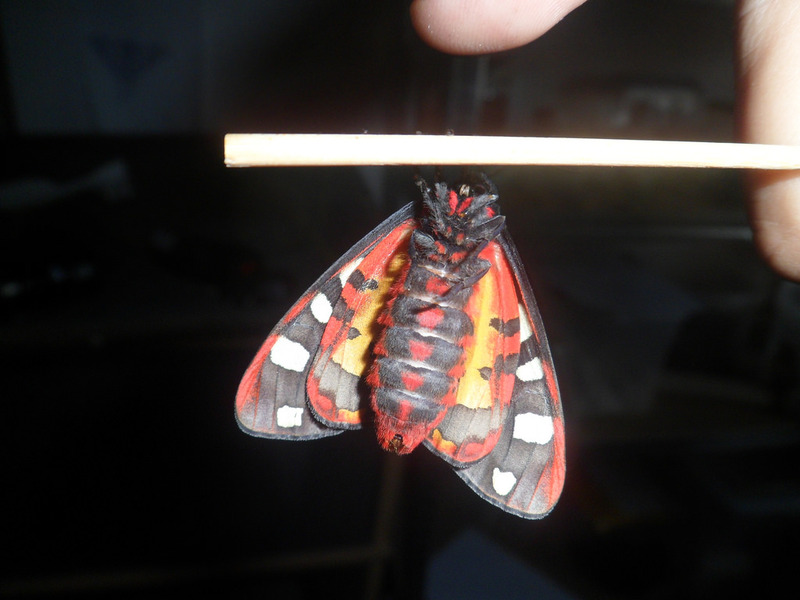 Front view; it is truly a magnificent moth. Raising them is very challenging because they have to overwinter as larvae. This means creating a setup where they will be stored cold, preferably frost free but around 0 degrees Celcius, with warmer days that will allow them to feed before returning to a diapause like state. This is not a species I would recommend to beginners. Mook's silky world While social media have replaced forums, one of the older forums about breeding moths still survives today – and it contains a treasure of caresheets and info. Entomologytoday (blog) Probably the biggest blog about insects today, click for science and interesting facts. All my insects! (Photogallery!) A photo gallery containing over 1000 pictures of my insect breeding, with a great diversity of butterflies and moths that I have bred and reared over the last few years. Enjoy!